People affected by cancer in Dundee now have access to much needed cancer information and support in libraries, following the opening of a new service in the city’s Central Library at the Wellgate Centre. As the lead trustee for Library and Information services on the Leisure and Culture Dundee board I was pleased to attend this important event. Macmillan Cancer Support has invested around £200,000 and is working with Leisure & Culture Dundee to provide three new cancer information and support drop in services in Libraries across Dundee. The first to open is the service in Central Library. 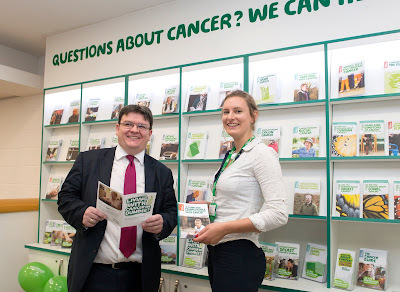 The new Macmillan Cancer Information & Support service will be run by a group of highly trained volunteers who can provide emotional and practical advice, access to information materials on various types of cancer and its treatment, or simply a listening ear. As well as specialist cancer information and emotional support, the service can refer people onto other services, including benefits advice and help to get active. This is an excellent initiative and it is further proof of the great work being done in libraries across Dundee. I hope that these initiatives from Macmillan in conjunction with Leisure & Culture Dundee make a difference to the lives of people impacted by cancer.